Just a note to say that Tune of the Month is on hold for a little bit. In the meantime, have fun exploring the Tune of the Month Archives! Our new Yellow Barn CD is winging its way out into the world! I'm so happy to announce that our newest collection of tunes is available for sale on CDBaby, as either a digital download or physical copy. Click HERE to visit our CD Baby page, where you can also preview snippets of the the tunes. You can also order physical copies of the CD directly from me (hopefiddle at gmail.com) or Rick Manning (rmannin4 at twcny.rr.com). We hope you enjoy the music! Escape from upstate New York's ice and snow into the warm glow of musical friendship, instruction, jamming, and inspiration at the Falling Waters Music Camp. Always a memorable weekend, the fifth year anniversary of the camp promises to be no exception. You can choose between attending the entire weekend, just one day, or come for one of the evening concerts. I've been enjoying the winter flock of birds at our feeder this month. We've had a mix of chickadees, juncos, mourning doves, cardinals, bluejays, and sparrows. 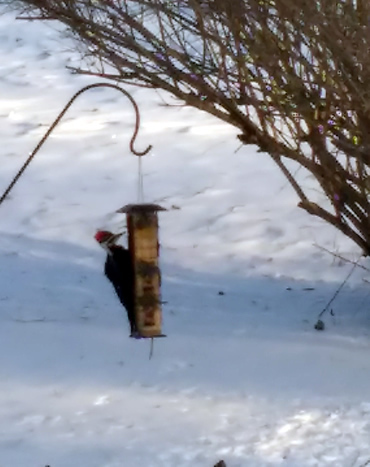 Yesterday we had a special visitor drop by - a pileated woodpecker! For perspective, the bird feeder in the photo is about 20" tall. 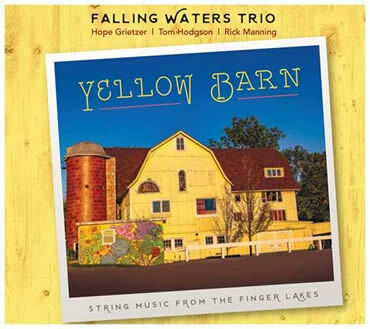 Good news: The physical copies of our new Yellow Barn CD have arrived, and as soon as we get the kinks worked out of the CDBaby downloads, we'll be officially mailing rewards to our Kickstarter backers and launching the release of the CD to the world! I'll be sending an email to announce the event when our ducks are neatly lined up in a row. P.S. Note that the formal release concert had to be postponed for a bit, but we'll let you know when that's being rescheduled. Registration for the Falling Waters Music Camp is now open! Camp will be held January 27 - 29, 2017 at La Tourelle in Ithaca, N.Y.
Instruction will be offered on fiddle, guitar, mandolin, banjo, dobro, singing and band at beginner, advanced beginner, intermediate and advanced levels in a variety of styles that include Irish, old-time, bluegrass, swing, contradance, and folk. Instructors / performers this year include Brian Conway, David Surette & Susie Burke, members of the Lonely Heartstring Band (Patrick M’Gonigle, George Clements, Matt Witler and Gabe Hirshfeld), Judy Hyman, Allison De Groot, Tatiana Hargreaves, Mark Panfil, Tim Ball, Paul Fairbanks, Rick Manning and others to be announced. Structured and impromptu jamming is a big part of the camp experience. This year the camp is offering more facilitated jam sessions for your participation and enjoyment, led by Curt Osgood, Michael Ludgate and friends. Visit the camp website for more information. Despite the weatherman's predictions, we've had an absolutely spectacular fall here in New York. 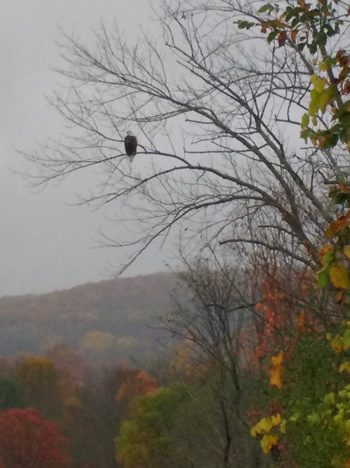 Here's the untouched October view from our livingroom window, and a majestic visitor who came to visit for a few hours - a bald eagle! Our new Yellow Barn CD is nearly finished! Recording and mixing are done and we're approving the mastering this weekend. It should be off to reproduction shortly. Huge thanks to Will Russell at Electric Wilburland for working with us and to Todd Edmonds at Iron Design for the artwork. The trio I play with here in New York, formerly known as Grietzer, Hodgson, Manning, (we finally have a new band name, to be revealed with the new CD!) will be doing a mini-tour in Colorado, highlighted by a feature performance at the Black Rose Acoustic Society in Colorado Springs. It would be lovely to see familiar faces in the audience! September has been a busy month so far. We met the goal for our Kickstarter campaign (huge thanks to all of our backers!) and have launched into the album creation process with lots of rehearsals and two full weekends of long days in the recording studio. But it's all worth it! 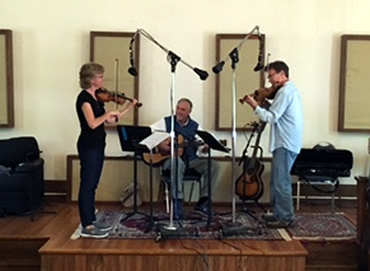 The new recordings are coming along nicely, and we can't wait to share them with you all! We're aiming for a November release. Here we are, hard at work over the weekend in the Electric Wilburland studio in Newfield, N.Y.
Friday, September 16: The Goodbye Girls in concert at La Tourelle in Ithaca. Fantastic old-time music! 7:30 p.m. The Goodbye Girls are a new and exciting quartet out of Boston. These four musicians from the US, Canada, and Sweden formed the band out of a common love for old-time, traditional bluegrass and Swedish traditional music. 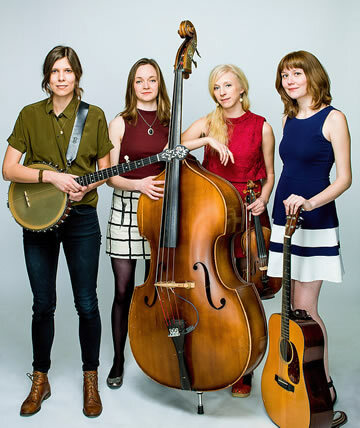 Lena Jonsson on fiddle, Allison de Groot on banjo, Brittany Karlson on bass, and Molly Tuttle on guitar & lead vocals are individually some of the best acoustic musicians around, and together they create a sound that is exciting, fresh and full of energy. Click HERE for a youtube video of the girls performing. This will be a fun show! Exciting news! Rick Manning, Tom Hodgson and I are going into the recording studio to make a second album of music! The CD will be called "Yellow Barn", and we've just launched a Kickstarter.com project to raise funds for the project. We have 28 days to fundraise, and lots of fun rewards for different levels of support (digital downloads, CD's, online lessons, even a house concert in your home.) Every penny helps! You can view our Kickstarter video (complete with bloopers at the end!) and all of the fun details by clicking HERE, or on the photo on the right. You can also find us on Kickstarter.com by searching on Yellow Barn. Thanks in advance for sharing the project link with friends, and any other help you can give us! Life's gotten a bit busy, so I'm putting the newsletter and Tune of the Month on hold for a couple of months. In the meantime, please enjoy the Tune of the Month archives. There are lots of fun melodies out there! I'm very excited to announce, especially to my Colorado friends and subscribers, that my trio Grietzer, Hodgson, Manning will be doing a mini-tour in Colorado, highlighted by a feature performance on October 28th, 2016 at the Black Rose Acoustic Society in Colorado Springs. I know, it's still a ways away, but I just had to share the news! I'm looking forward to chatting and sharing music with dear friends and the wonderful community of the Black Rose. More details as we get closer to the date! There's nothing like being immersed in a sea of musicians for a weekend to brighten up these chilly winter days. Those of us living in the Southern Tier and Central New York are SO lucky to have a vibrant first-class traditional music camp right here in our own backyard! From Friday, January 15, to Sunday, January 17, the Falling Waters Music Camp at La Tourelle Resort in Ithaca, N.Y. heads the lineup with a weekend of instruction, jamming and performance. 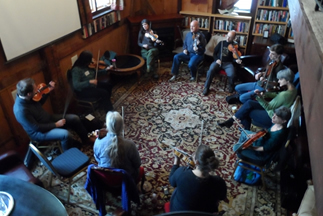 Workshops will be offered on fiddle, guitar, mandolin, banjo, bass and singing at beginner, advanced beginner, intermediate and advanced levels in a variety of styles, including Irish, old-time, bluegrass, swing, French Canadian, Scandinavian, contradance, and folk. 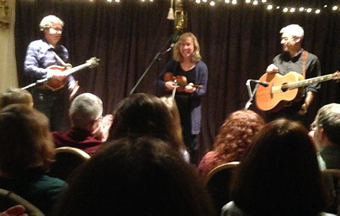 Saturday, January 16: John Kirk Trish Miller, and Ed Lowman headline the Cranberry Coffeehouse stage in Binghamton, N.Y. Fiddlers John and Ed lead the way, playing selections from Americana, Canadian and Celtic styles. Trish rounds out the sound with guitar, banjo and fancy footwork. These multi-instrumentalists interchange instruments, adding occasional mandolin, ukelele or bass to the mix. This is a lively show that usually sells out quickly! Unitarian Universalist Church, 183 Riverside Drive, Binghamton, 7:30 p.m. $8.00. The Winter Village Bluegrass Festival will be held January 23 – 25, 2015 at La Tourelle and the State Theatre of Ithaca. 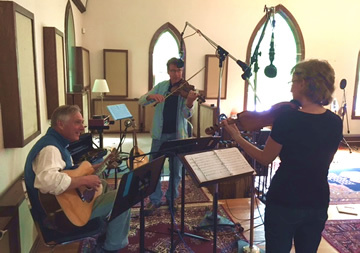 The Travelin’ McCourys headline the Saturday night Big Show at the State Theatre of Ithaca and conduct an unplugged band workshop at La Tourelle on Saturday afternoon. Mr. Sun, featuring Darol Anger, Grant Gordy, Joe Walsh, Karl Doty and special guest Tony Trischka and the exciting new duo of Michael Daves and Brittany Haas will perform and teach throughout the weekend and join the McCourys for the Saturday night show at the State Theatre. 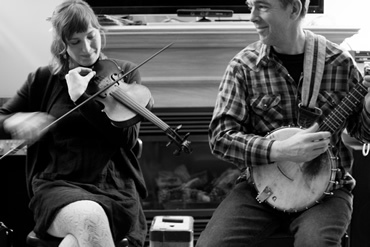 Ithaca’s favorite old time music duo Richie & Rosie will be performing on Saturday along with Too Blue, a fine swinging bluegrass band from the New York City area. Ithaca’s Paris Texas featuring Bobby Henrie round out the lineup. Fiddler Tim Ball is starting up the Winter 2016 session of his fiddle class. The first session is on Sunday, January 10th, 12:00 p.m.Tim is a fantastic fiddle player, fluent in a variety of styles. From Tim: "Though it's called a "fiddle" class and is somewhat geared toward fiddles, other string & wind instruments are welcome & encouraged. Prior experience with fiddle music is not necessary, but students should be able to play their instrument comfortably. String students should know D and G major scales & arpeggios throughout first position (mid-late book 1 for Suzuki violin students... ask if you're wondering)." 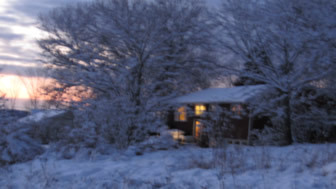 The class will be held at the Ithaca Waldorf School, at 20 Nelson Road, Ithaca, NY (off of 96B on South Hill). The cost of the class is $50/student or $80/family. For more information or to register, you can contact Tim at timothy.ball.violin@gmail.com, or by phone at 607-351-5982. An afternoon of tea and sweets, live music and an English Country Dance awaits you this Sunday! 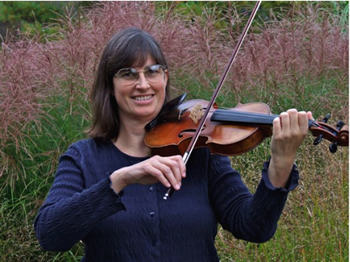 Fiddler Kathy Selby will be hosting the event in her home, and all are welcome. What is an “English Country Dance”? This is the dancing that you see in Jane Austen movies. Some of the dances are elegant, most are lively, some are more than a bit silly, and they’re all fun. Our dance masters will teach the dances and call the moves during the dances, and if you can walk, you can do this. What is “afternoon tea”? This is the good part of English food: a mid-afternoon indulgence consisting of scones with butter, jam and whipped cream, and cakes and other goodies. No boiled cabbage. WHERE: The Ellis Hollow Assembly Rooms. These are Kathy and Séamus’ living and dining rooms, featuring a 400 sq ft hardwood dance floor and a vaulted ceiling. About 8 miles East of Ithaca. Directions at www.kathyselby.com/directions.htm PLEASE WEAR CLEAN SOFT-SOLED SHOES for dancing. OUR MUSICIANS will be THE ELLIS HOLLOW ASSEMBLY PLAYERS: Hope Grietzer and Kathy Selby (fiddles), Gordon Bonnet (flute), John Wobus (piano), and guests. OUR DANCE MASTERS will include the very special Pamela Goddard, Katy Heine, and other great callers. SUGGESTED DONATION: $7, or bring something delicious to eat. RSVP's: Appreciated, but not necessary. NEED MORE INFO? Reply to this email, or call Kathy at (607) 539-7526.
WHO SHOULD COME: Everyone who loves to dance and have fun is very welcome. Please tell your friends! 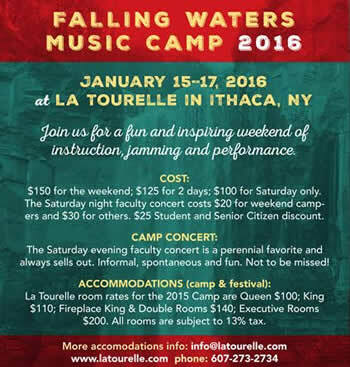 The Falling Waters Music Camp at La Tourelle Resort in Ithaca, N.Y. has fantastic workshops lined up for the weekend of January 15 - 17th, 2016. You can attend for one day or the whole weekend. Don't miss the fabulous instructor concert on Saturday evening! It's open to the public, even if you aren't attending the camp, and sells out every year. 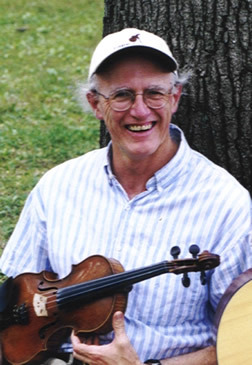 One of the great patriarchs of New England style fiddling, George Wilson, will be presenting a fiddle workshop at the Caanan Institute just east of Ithaca, N.Y. 11:00 - 1:00 p.m. George's workshops are always educational and a heck of a lot of fun. A talented, multi-instrumentalist and singer, George Wilson's repertoire samples a wide variety of traditional and folk styles. As a fiddler, he has over 500 tunes for dancing and listening — tunes from New England, Quebec, Cape Breton, Scotland, Ireland and Shetland. 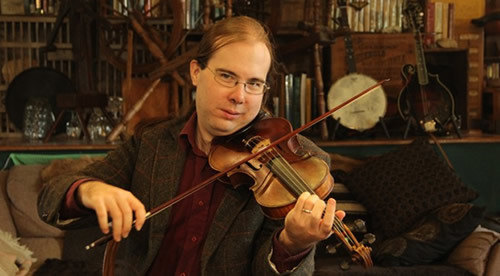 His dynamic fiddling, strongly influenced by Cape Breton and French Canadian styles, has been popular with contra dancers and concert-goers since the late 1970s. RSVP to mike@cinst.org for more information, to reserve your place, and for directions to this private venue. WHERE: The Ellis Hollow Ceilidh Hall. This is Kathy and Séamus' living room, featuring a 400 sq ft hardwood dance floor and a vaulted ceiling. About 8 miles East of Ithaca. Directions at www.kathyselby.com/directions.htm PLEASE WEAR CLEAN SOFT-SOLED SHOES for dancing. WHAT is a "ceilidh dance"? "Ceilidh" (KAY-LEE) just means "gathering", so we can have any kind of dances we enjoy! We will likely dance some contras, barn dances, squares, some dances from England, Scotland and Ireland, and some yiddish dances. All the dances will be easy to learn and very fun to do. OUR MUSICIANS will be THE ELLIS HOLLOW CEILIDH BAND: Hope Grietzer and Kathy Selby (fiddles), Gordon Bonnet (flute), John Wobus (piano), and guests. OUR CALLERS will include the very special Pamela Goddard, Katy Heine, and other great callers. SUGGESTED DONATION: $7.00, or bring something delicious to eat. NEED MORE INFO? Call Kathy at (607) 539-7526. Do you love to waltz? Or just listening to waltzes? I'll be performing an evening of waltzes with Cascadilla Creek, an all-woman band of talented string and pipes players, at the Trumansburg Conservatory of Fine Arts, Trumansburg, N.Y., on November 20th, 7:30 p.m. The event is a dance-concert fundraiser for the conservatory and will include waltz instruction conducted by Ted Crane and Pamela Goddard, beginning at 7:00 p.m. Short stints of instruction will be provided thru the evening. As well as waltzes, the band plays Scottish and Irish contra dance music, with lively tunes and fun in store for all! Suggested donation at the door is $6.00. at La Tourelle Resort in Ithaca, N.Y.
On Sunday November 22nd, fiddler Laurie Hart will be performing for a Scandinavian dance at Slow Lane (888 Comfort Rd.) in Danby, N.Y. from 2:00 - 5:00 pm. She'll be playing both regular and hardanger fiddles, with Stefhan Ohlström on fiddle and maybe nyckelharpa, and Steve Ellner on accordion, and perhaps surprise guests. Informal dance instruction for beginners and more advanced dancers in polska/pols, gammaldans (waltz, schottis, polka, hambo, snoa) and springar/gangar will be offered by Franziska Bayer and others according to interest. Admission $5.00 to $10.00 sliding scale, or buy one of Laurie's CDs and get in free! The date for our house concert is nearly here! Sunday, October 18th at 2:30 p.m. If you'd like to come early and socialize, there will be a potluck and informal jam starting at 1:00 p.m.
Several people have asked if a house concert is open to the general public, and is definitely is. You can make a reservation in advance if you like by calling Pam at 607.342.4110. She can give you directions at that time as well. The suggested donation is $12 adults, $8 students, kids under 10 free. Reservations are encouraged! Interested in carpooling from the Southern Tier? Drop me an email and I'll help folks connect. Fiddler Tim Ball is starting his fall group fiddle class at the Ithaca Waldorf School, at 20 Nelson Road, Ithaca, NY (off of 96B on South Hill). Tim is a fantastic fiddle player, fluent in a variety of styles. "The goal of the class is to provide a place for people who are learning fiddle to play tunes together with some guidance. We focus on learning by ear, playing well as a group, and jamming. In the past we've divided the group into "beginner" and "intermediate" classes for some of the time - if the class is big enough, I plan to do that again. Though it's called a "fiddle" class and is somewhat geared toward fiddles, other string & wind instruments are welcome & encouraged. Prior experience with fiddle music is not necessary, but students should be able to play their instrument comfortably. String students should know D and G major scales & arpeggios throughout first position (mid-late book 1 for Suzuki violin students... ask if you're wondering)." The cost of the class is $50/student or $80/family. You can contact Tim for more information or to sign up at timothy.ball.violin@gmail.com or 607-351-5982. 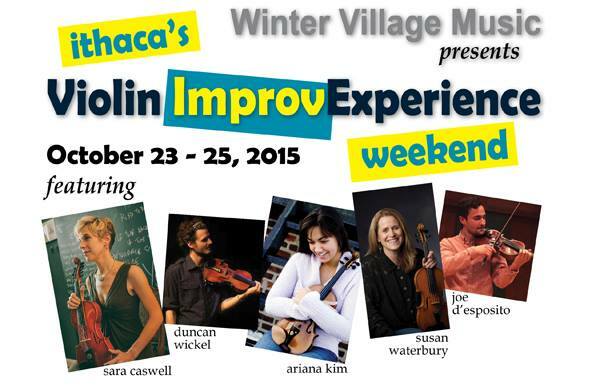 Last month I posted a heads up about the fantastic Violin Improv Extravaganza Weekend taking place in Ithaca on October 23 - 25th. 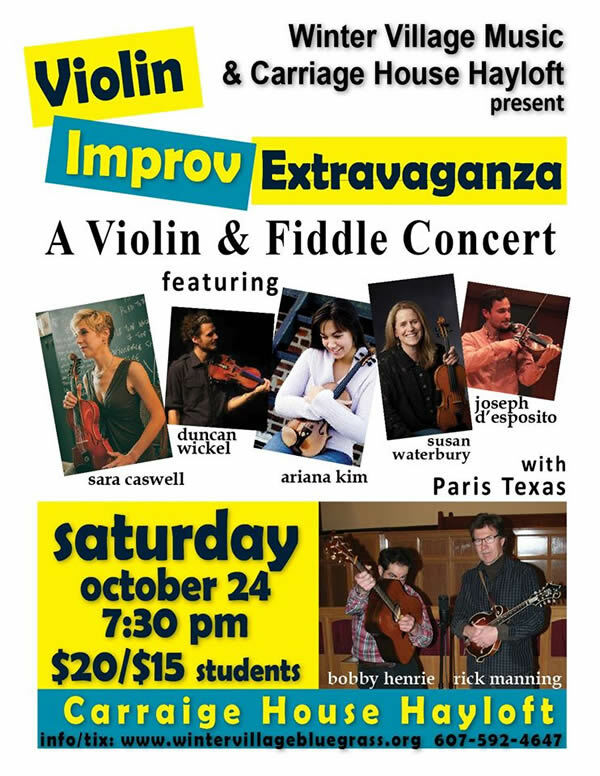 The instructors for the event will also be performing in a Violin and Fiddle Concert open to the public on Saturday night, October 24th. 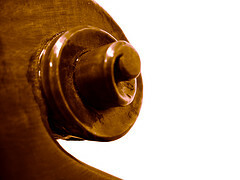 Violin or fiddle players of all levels will find this an inspirational event! Okay, maybe extravaganza is a bit of an exaggeration. There won't be any balloons or fireworks, after all. But lots of fun will be had! 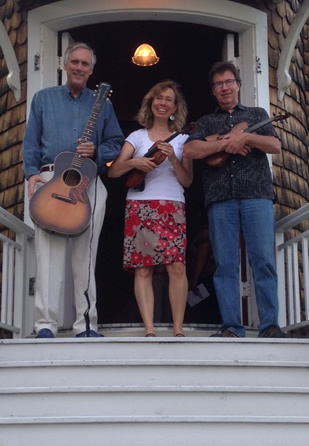 The Grietzer, Hodgson, Manning trio will be performing a house concert on Sunday afternoon, October 18, preceded by a potluck and jam session for those that would like to socialize and/or share a few tunes before the show. The potluck/jam will begin at 1:00, with the concert kicking off at 2:30. The most amazing part about the afternoon? We'll be nestled in acres of upstate New York's glorious fall scenery, in Pamela Goddard and Ted Crane's stunning, floor-to-ceiling-windowed great room in their home in Danby, N.Y., just south of Ithaca. SNEAK PREVIEW: Here we are in a live performance at Raquette Lake in the Adirondacks, playing "The Zipper" ridiculously fast (tune by James Schulz). Small country fairs have always enchanted me! With horse-drawn wagon rides, quilt raffles, old-fashioned games and amazing baked goods, an afternoon at a fair is like stepping back in time. 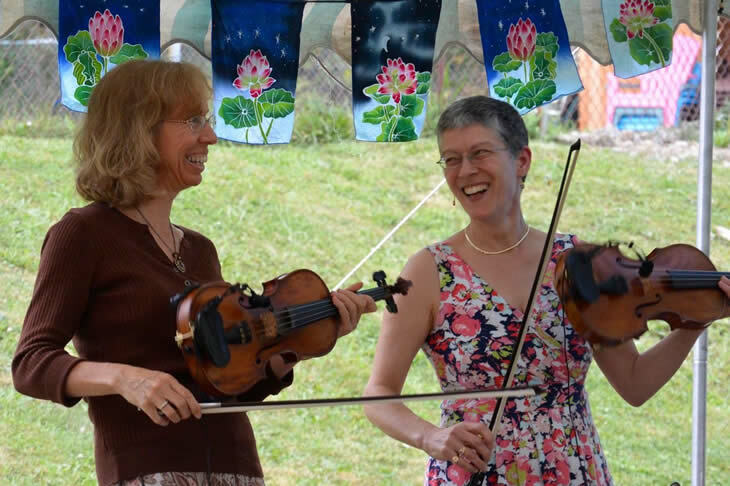 On Saturday, September 12th, I'll be performing lively fiddle tunes with friends Kathy Selby (fiddle) and John Wobus (keyboard) at The Ellis Hollow Country Fair, 111 Genung Rd, Ithaca, N.Y., from 3:00 - 4:00. There will be live music throughout the day from bands in a variety of styles. The fair site is halfway between Ellis Hollow Road and Ellis Hollow Creek Road. On Saturday, September 26th, the Toast n' Jammers fiddle group will be performing at the Greene Apple Festival, Greene, N.Y., Noon - 1:00. Fresh pressed cider, live music, and an astonishing number of craft vendors make for a lively afternoon. Hope to see you at one of these charming fairs! Fiddlin's Fun, the local chapter of the New York State Old Time Fiddlers' Association, will be performing at the New York State Fiddlers' Hall of Fame Pavillion in Osceola, N.Y. on Sunday, September 13th from 2:00 - 5:00 p.m.
You can tour the Fiddlers' Hall of Fame Museum, hear live traditional fiddle music, play on the open stage portion of the event if you'd like, and enjoy a lovely afternoon in the Tug Hill Plateau region of New York. 1121 Comins Rd, Redfield, N.Y. For more information, click here. ...and don't forget the monthly Fiddlin's Fun fiddle tune jams, held on the fourth Friday of each month at the Unitarian Universalist Church, 183 Riverside Drive, Binghamton, New York. Parking and entrance in the back. Come to play or listen! 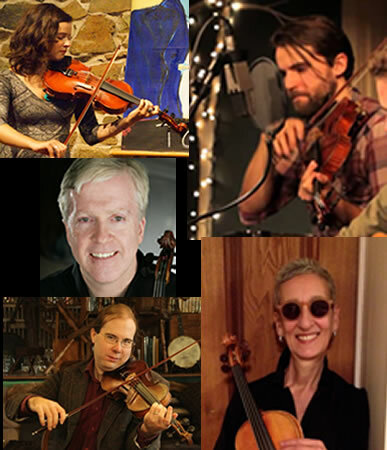 The weekend is for violinists and fiddlers interested in advanced instruction on improvisation taught by jazz violinist Sara Caswell, eclectic fiddler Duncan Wickel, Cornell violin professor Ariana Kim, Ithaca College violin professor Susan Waterbury, and violinist/fiddler Joe D'Esposito. 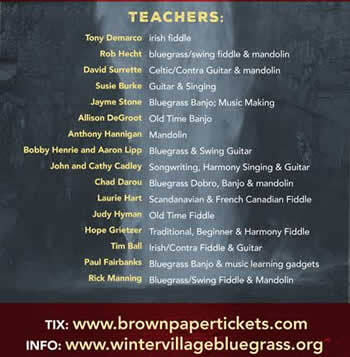 Learn more at www.wintervillagebluegrass.org and register at http://ithacaviolinimprovexperience.brownpapertickets.com. Looking forward to just as exciting a time in August. Summer is entirely too short! 115 S. Danby Road, Ithaca, N.Y.
On the evening of August 11th, 5:30 - 7:00, Rosie Newton and Richie Stearns will be kicking off the first event of the new Fiddle by Firelight series! Settle in around a campfire for an intimate jam session with favorite Finger Lakes musicians. The bar will be open ‘til 11pm, serving homemade s’mores, local beers, wines, ciders and spirits. This is a public event. No tickets required. More information here. 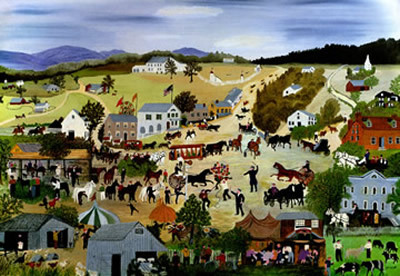 August 15 - 16: Old Time Fiddlers' Fair at the Genesee Country Museum in Mumford, N.Y. This is one of my favorite fiddling events in New York State. 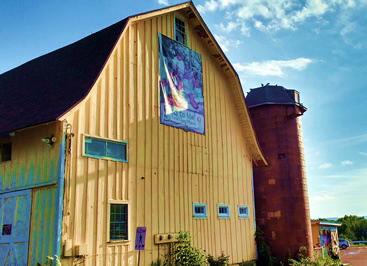 Set on the picturesque grounds of the museum's historic village, fiddlers of all ages gather from across the state to perform on the open stage, hear fiddle concerts in the huge barn or in an intimate historic church, attend workshops and jam on favorite tunes. The historic village is near the fairgrounds, where costumed re-enactors bring the 1800's to life. The event is fun for the whole family, musicans and non-musicians alike. More information here at the museum's website. August 20 - 23: Pickin in the Pasture, Lodi, N.Y.
Pickin' in the Pasture is four days of world-class bluegrass concerts and fantastic jamming held on a working sheep farm in the heart of the beautiful Finger Lakes region. One of New York State's premier bluegrass festivals. More information here on the festival's website. July! What a glorious month. We had bluebirds nesting in boxes adjacent to our yard this year, and one of them is still hanging around. It makes me smile to see it perched on top of our lamppost when I go for my morning walk. June's Strawberry Festival parade was entirely too much fun. Our musicians were featured both on the evening news and in the local newspaper's website. Looking forward to next year! There's nothing quite like a weekend in the Thousand Islands for summer relaxation. 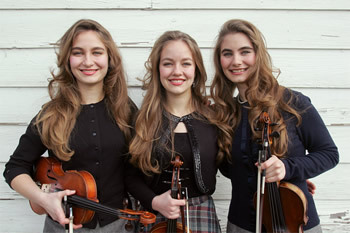 Each year the Grietzer, Hodgson, Manning trio performs a concert on Wellseley Island at historic Densmore Church. The acoustics in the old church are amazing, and its pews are usually packed with a very fun crowd. This year we'll be there on Sunday, July 12th, 7:00 p.m. Come join us! "Fiddle Queens of New York State"
Live concerts, jams and workshops at the Fiddlers' Picnic Festival in Osceola, N.Y., July 24th - 26th. Jackie Hobbs, Gretchen Banaszak and I will be performing concerts and teaching workshops throughout the weekend. Lots of twin and triple fiddle harmonies will be drifting through the air, I'm certain! There will also be jamming, square dances, open mike events, and of course Sunday's ceremony for this year's New York and North American Fiddlers' Hall of Fame inductees. Spend an afternoon, a day, or the entire weekend up in the beautiful rural north country of New York State. Tickets are $5.00 per day in advance or $8.00 per day at the gate. The cost for Saturday's workshops (includes all three instructors, 9:00 am to 12:30), is $35.00 advance, $40.00 at the gate. Advance tickets are available online at eventjoy.com. You can find more information on the event at the www.nysotfa.com website. 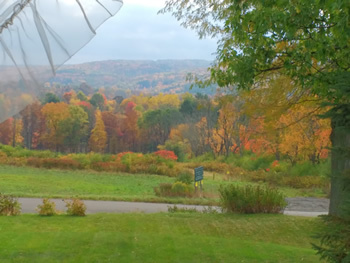 Join us in the beautiful Tug Hill Plateau region of New York! The Ashokan Fiddle Camp's Northern Week happens July 19 - 25th. Contras, squares, English dances, Scandinavian turning dances, fiddle, nyckelharpa, mando, guitar, piano, singing, calling, band clinics, dance parties, jam sessions, song swaps and more! The Grey Fox Bluegrass Festival is July 16 - 19th in Oak Hill, N.Y. With an all-star lineup of artists (Del McCoury, Hot Rize, Sam Bush, Bela Fleck and more), this is New York State's premier bluegrass festival. Every Sunday during the summer (with the exception of August 16th), the New York State Old Time Fiddlers' Association hosts fiddle concerts at the Hall of Fame Pavillion in Osceola, N.Y., 2:00 - 5:00 p.m. See the full summer schedule here. The parade information for this Saturday's Owego Strawberry Festival arrived in the mail today. There are some BIG changes from last year! Our line up position is on the same street as last year (Temple St, between Spencer Ave and Paige St), and we are slot 11, which is a little further back than last year. For new participants, the "slot numbers" will be chalked on the pavement. Please try to arrive at the line up spot by 9:15, allowing plenty of time to find parking and walk in. TO BE ALLOWED INTO THE LINE UP AREA, EMAIL ME (hopefiddle at gmail dot com) FOR A COPY OF OUR PARADE DOCUMENTATION AND BRING IT WITH YOU TO THE PARADE. There are IMPORTANT security changes from last year, summarized below. 1) The entire line up area will be blockaded, with police and parade personnel checking that everyone who enters has a copy of the parade confirmation letter. 2) We are only allowed to enter the line up area at a specific blockade point, based on which section of the parade we're in. We are Section 3, and our entry point is at the intersection of Temple and Paige streets. Even though the documentation says that we are allowed in at blockade 3 ONLY, I've confirmed that we'll also have to pass through either blockade 2 or blockade 5 to get to our spot (This will make sense when you see the map in the parade documentation). You must show the parade documentation to the personnel at the blockades to be allowed in. 3) Parking is allowed on Franklin St and Chestnut St for parade participants, but will be extremely limited. If you do park there, you must have the parade confirmation letter visible on your dashboard. (The parade coordinator told me this last fact verbally, it's not in the documentation.) You may want to use the parking and shuttle information below instead, and carry your instrument case in. Jim and I will arrive super early to secure a spot for our vehicle on Franklin St so you can use it to store instrument cases in, etc during the parade. My cell phone number is 607-972-6497 should you need it. "Parking (includes handicap shuttles) and shuttle bus service will be available all day on Saturday June 20 and is available at Hickories Park and Marvin Park (Tioga County Fairgrounds, Rt. 17C West - Exit 64). Cost to ride the shuttle is $3 per car. Parking from the East is available at Hickories Park (Route 17C) beginning at 7:30 am and shuttle by 8 am. Parking from the West is available at Marvin Park (Route 17C). VENDOR shuttle and parking is available at 6 am from Marvin Park. Festival parking begins at 7:30 am with shuttle by 8 am. Shuttles run until 6 pm or until the lots are empty. The downtown area is closed to traffic from early morning through the conclusion of the festival. This includes lower North Avenue, the adjoining portion of Main Street, Lake Street, Church Street, between Main and Front Streets, Front and Court Street. The Court Street Bridge and Park Street (will become 2-way) will remain open." Regarding weather: We won't be able to participate if it's raining. Jim and I will be heading down to the site by 7:30 am. If it's obvious by that time that inclement weather will prevent us from marching, I'll post it on the "latest news" page of my website. If it starts raining heavily after that time and doesn't appear it'll clear up, try my cell phone or use your best judgement. Remember to bring the parade documentation with you. I'm looking forward to the event! Welcome to June! This month is jam-packed with fun things to do. I'm excited to announce that Rick Manning, Tom Hodgson, and I will be performing together on Sunday, June 28th, in Ithaca, N.Y. on WVBR's Bound for Glory radio show, 8:00 - 11:00 p.m. Eastern time. The show is broadcast from the Anabel Taylor Hall Cafe on the Cornell University campus, and will be streamed over the internet for folks in other time zones. Hope to see you at the cafe! We have a fantastic group gathering to march in the Owego Strawberry Festival Parade on Saturday morning, June 20th, but there's always room for more! Any fiddlers, guitarists, mandolinists, etc, that would like to join in, drop me an email at hopefiddle@gmail.com and I'll add you to the event email list for updates on line up time and place. Tunes for this year are below, and pdf's and mp3 files for them are available HERE. Note that if it rains heavily that morning we won't be able to participate. I'll post an update on my "latest news" page if so. 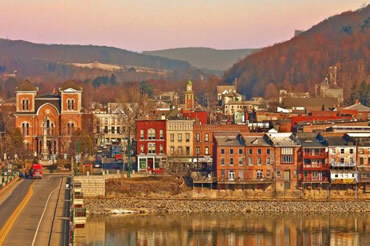 The Susquehanna River from the riverwalk in Owego, N.Y. 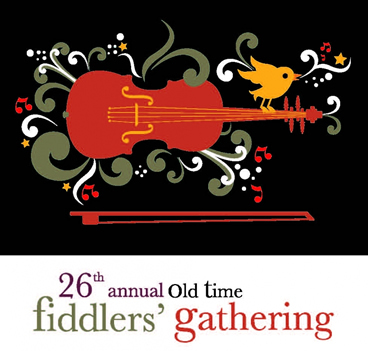 The 26th Annual Old Time Fiddlers Gathering will be held June 20 - 21st, at Lakewood Vineyards, Watkins Glen. Among the featured performers this year are Jackie Hobbs, George Harriger, Don Woodcock, and Rosie Newton, and Gretchen Koehler. Visit http://www.earts.org/fiddlers-gathering for more information. 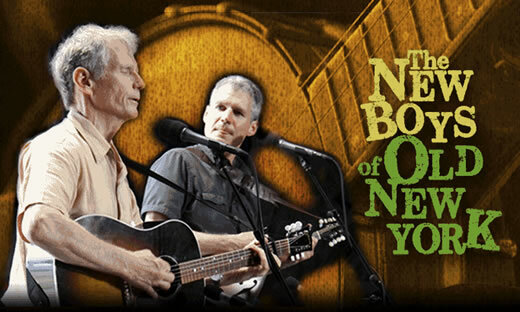 The 35th Annual Old Songs Festival will be June 26 - 28th, Altamont, N.Y. 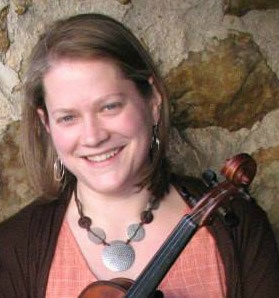 Featured fiddlers include Donna Hebert, April Verch, George Wilson, Dennis Stroughmatt and Andrew and Noah VanNorstrand. Visit http://festival.oldsongs.org/ for more information. At last! Sunshine and balmy breezes are upon us. 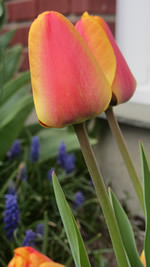 What a joy to throw open the windows and let in the spring. 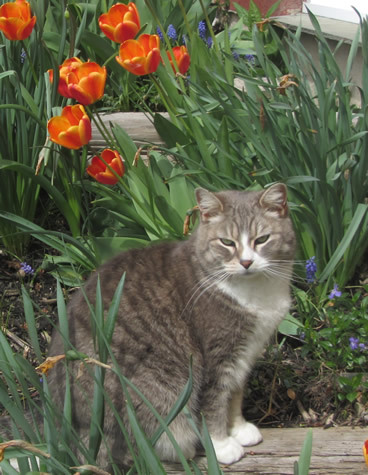 Although she may not look it, after an icy winter curled up in her cat bed dreaming of tasty mice, Kitty is also overjoyed at romping outside again. She's just easily irritated by the local papparazzi hounding her (ahem, that would be me). Okay, enough sillyness. It's time to tune up our fiddles and get ready for the summer festivals that will soon be upon us! 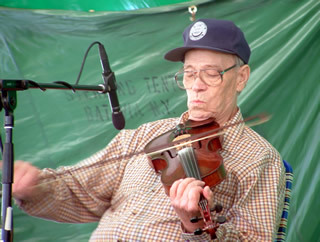 June 20 - 21st: Watkin's Glen Annual Old Time Fiddlers Gathering. July 9 - 12th: Busy Bird Bluegrass Festival, Berkshire, N.Y.
July 16 - 19th: Grey Fox Bluegrass Festival, Oak Hill, N.Y.
July 24 - 26th: 43rd Annual Fiddlers' Picnic, Osceola, N.Y. 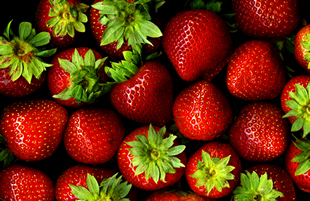 The Owego Strawberry Festival parade is Saturday, June 20th this year, 10:00 a.m., and once more we've reserved a spot for fiddlers and other acoustic musicians to march in the parade. After all, why should brass instruments have all the fun? The parade is a one mile long loop, winding through downtown Owego. We'll repeat a few simple, march-y tunes. Here's a link to last year's tunes to give you an idea. Like to participate but don't feel confident playing? We could use candy tossers to march along with us too. If you'd like to join in, please drop me an email at hopefiddle@gmail.com and I'll add you to the list for event detail updates. This event is always a ton of fun! We had a blast in this spring's Beginning Fiddle for Adults class! I'll be offering another six week session, Beginning Fiddle II, on Wednesday evenings, 6:00 p.m., starting May 20th. If you're a beginning fiddler comfortable with playing a few easy tunes and would like to join in on this next set of sessions, drop me an email at hopefiddle@gmail.com and we can chat about whether the class would be a good fit for you. More details on the classes here. May 23 - 24th: PENNY Memorial Day Bluegrass Festival, Wrench's Ranch, Route 206, Coventryville, N.Y. Stage shows, food, rough camping, and lots of field pickin' so bring instruments. Music runs 5:00 p.m. to 11:00 p.m. Saturday, and 11:00 a.m. to 10:00 p.m. Sunday. For more information please call 607-748-6671. $30 for the weekend. I'm excited to be included as one of the New York State Old Time Fiddlers' Association's "Fiddle Queens of New York State" at the Fiddlers' Picnic Festival this summer in Osceola, N.Y., the weekend of July 24th - 26th. Spend an afternoon, a day, or the entire weekend up in the beautiful rural north country of New York State. Tickets are $5.00 per day in advance or $8.00 per day at the gate. The cost for Saturday's workshops (includes all three instructors, 9:00 am to 12:30), is $35.00 advance, $40.00 at the gate. Advance tickets are available online at eventjoy.com. You can find more information on the event at the www.nysotfa.com website. Saturday, April 11th: Brittany Haas, Joe Walsh and Owen Marshall, all day event at the Canaan Institute in Brooktondale N.Y.
Masters of old-time, Celtic, and bluegrass music, all three musicians are widely respected on their chosen instruments (fiddle, guitar, and mandolin).Workshops on all three instruments will be held 2:00-4:30 p.m. $25; Potluck dinner 5:00-6:30 p.m. (bring a dish to share); Concert 7:00-9:30 p.m. $20. There will be a music jam with the band after the concert. All are welcome to play or listen. We will learn a traditional old-time fiddle tune by ear, starting by breaking it down into phrases, then putting it all together. Once we have the tune down, we’ll work on making it sound true to the Appalachian style. This will include learning bowing patterns and techniques, double stops and drones, and left hand ornamentation. We will also learn the chords to the tune and some ideas for how to play back-up on it. Saturday, April 11th: the Binghamton Contradance with Sophie Orzechowski. Trinity Memorial Church, 44 Main St., Binghamton. 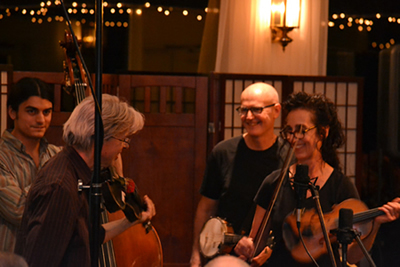 7:00 p.m.
Sunday, April 19th: The Owego Contradance with Kathy's band "Crooked Sixpence", including Gordon Bonnet on flute and John Wobus on keyboard. Tioga Trails Cafe, 50 Lake Street, Owego. 4:00 p.m. - 7:00 p.m.
Saturday, April 11th: The 12th Annual Busy Bird Bluegrass Festival presents: Early Bird Spring Festival. Featuring The Mathews Family Tradition, Melanie and the Boys, Plexigrass, Slewfoot, and Chad Darou and Stealing Time. A note: Chad Darou and Stealing Time features 17-year-old Sean Martin on fiddle. It's a real treat to hear Sean play! Owego VFW, 207 Main St., Owego, N.Y. Doors open at 10:00 a.m., concert start at noon. $10.00 admission. Food and refreshments available. Bring your instrument for some jamming! 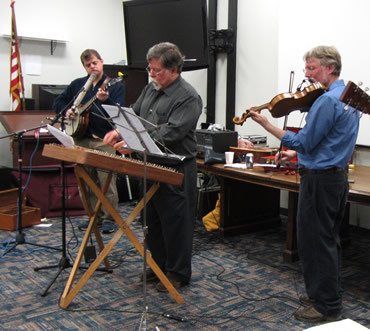 Saturday, April 25th: Cabin Fever Concert at the Vestal Library, 320 Vestal Parkway East, Vestal, N.Y. Curt Osgood on hammered dulcimer, Henry Jankiewicz on fiddle, Rob Siegers on banjo, and Annie Simpson on guitar. 7:00 p.m. This annual concert always draws a full house, so arrive early for a good seat! Our area broke its record for cold in February, with the average temperature clocking in at a whopping five degrees! I'm longing for the day we can throw open the windows to balmy breezes again. I heard from a relative in Wilkes Barre, Pennsylvania that their robins are back. Fingers crossed that they'll be here in a week or two to chase away our snow and cold! 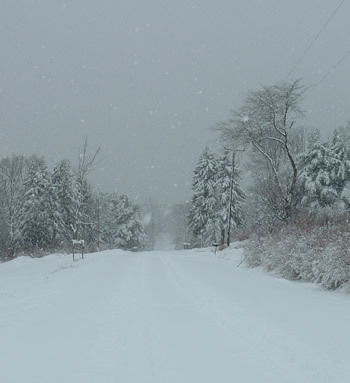 The photo is the view looking down our road from our driveway. Makes me want to play a rousing rendition of "Cold Frosty Morning". Oh, quick reminder: For those that are interested, there are just a few spots left in my "Beginning Fiddle for Adults" class through Broome Community College's Continuing Education program. Click here for more information. 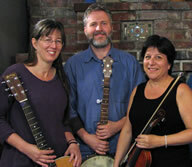 Friday, March 6: String band trio Low Lily in concert at Valley Folk. 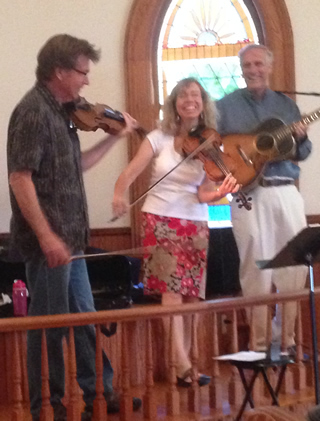 With Lissa Schneckenburer on fiddle, (one of my favorites!) Low Lily performs traditional songs and tunes alongside stunning original pieces. Their new album debuted in seventh spot on the International Folk DJ charts. 144 Cedar Street, First Methodist Church Auditorium, Corning NY (Corner Cedar and First Streets), pre-concert jam session 6:00 p.m., concert at 7:30 p.m. Admission: $20 cash or checks only at-the-door; children 14 and under free with adult; $5 Students (full-time college/high school) and disabled. Visit www.valleyfolk.org for more information. 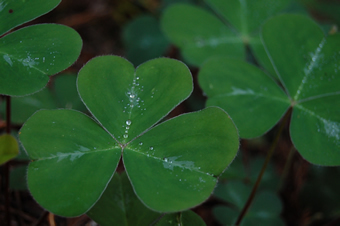 Saturday, March 7th: Going to the Binghamton St. Paddy's Day Parade? (I know, the date is a bit early.) Stop by the pancake breakfast at the American Legion, 80 Main St., Binghamton, where one of our local fiddle tune jam groups, The Java Joe Jammers, will be playing tunes from 9:00 - 11:00 a.m.
Saturday, March 7th: Annual Penny Midwinter Bluegrass Day, Vestal American Legion, Jensen Rd, Vestal, N.Y. (behind Kohl's). 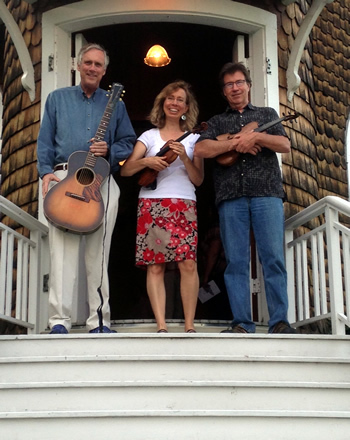 Concerts with local bluegrass bands in the upstairs, jamming rooms downstairs. 11:00 am - 6:00 p.m. For more information please contact Gene Clayton at 607-748-6671. Sunday, March 15th: Owego Contradance with Seaglass. 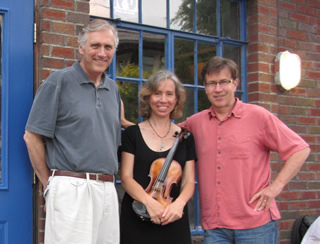 Seaglass is composed of three of the absolute best contradance musicians in New York State. 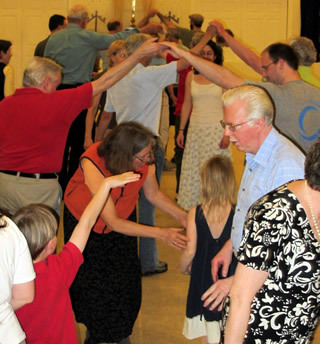 If you've never been to a contradance before, this would be the one to try out. With Andrew Van Norstrand on guitar, Eileen Nicholson on fiddle, and Rachel Bell on accordion, you'll have a marvelous afternoon whether you love to dance or just sit with a cup of coffee and listen. Also, I have to say that the Tioga Trails Cafe, among its many culinary delights, has the best sweet potato fries in town. Tioga Trails Cafe, Lake St., Owego, N.Y. 4:00 p.m. - 7:00 p.m.
Tuesday, March 17th: Celebrate St. Paddy's Day at Gallagher's Irish Pub with Curt Osgood and friends. 6:00 -9:00 p.m., 92 Robinson St, Binghamton, N.Y. I had tons of fun teaching at the Falling Waters Music Camp in Ithaca! Nearly 100 campers participated this year. Music floated through the air all weekend, whether from the various jam sessions, the myriad workshops or the super-fun, sold-out Saturday night concert. Mark your calenders for next January! Rick Manning and myself performing with Keith Murphy at the event. 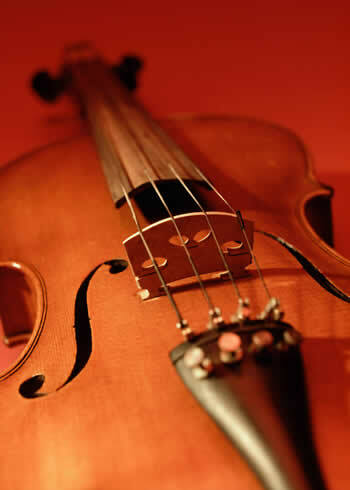 Have you always loved the sound of the fiddle and wished that you could play? Perhaps you had lessons on the violin as a child but haven’t touched it since. 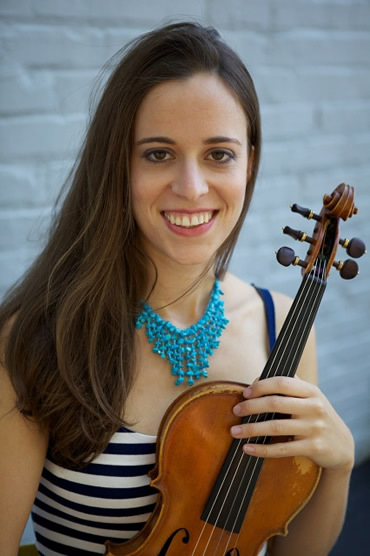 I'll be teaching a six-week "Beginning Fiddle for Adults" class through Broome Community College's Continuing Education program on Wednesdays, March 11th - April 22nd (no class April 1st) , 6:00 - 7:00 p.m. If you or someone you know might be interested, click here for more information. All registrations are taken through the college at 607-778-5012. This class always fills quickly! Our Toast n' Jammers family fiddle club will be performing at Boscov's Irish Celebration in downtown Binghamton on Saturday, February 28th, 2:00 - 2:30, 4th floor auditorium. Come down to share in a day of Irish music and dance! Looking for something to do on a Wednesday evening? There's an Irish jam at the AOH, 141 Main St., Binghamton, N.Y., at 7:00 pm on the 2nd and 4th Wednesdays of the month. Join in the tunes or just come to listen. Friday, February 27th: House concert CD release party for the band Tempest followed by a jam session at the Canaan Institute, just outside Ithaca, 7:00 p.m. Full 6 piece band! Tim Ball - fiddle; Chuck Abell - guitar, vocals; Eric Metzger - drums. Also with: Harry Aceto - bass; Erik Stabnau - saxophone; Brendan Lanigan - trombone. $12 at the door. RSVP's requested for this priviate venue to mike@cinst.org. We had a marvelous Christmas with four generations of family at my sister's house in Maryland, ranging from my 85 year old mother to the newest member of the family, great-grandbaby Tristan. My niece Meridian is playing the fiddle these days too, and we had a great time playing Beatles tunes and harmonies on Christmas carols together. Set aside more time to play for my own enjoyment, with no set goal or purpose in mind. The photo? Yes, it does kind of look like a fiddler poking an iceberg with his bow. Or Luke Skywalker with a lightsaber on a frozen alien planet. It's actually an intrepid (or foolhardy!) 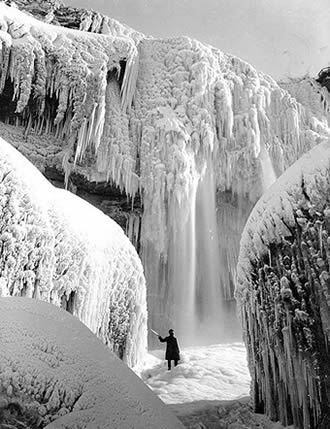 soul at an icy Niagara Falls in 1911. Falling Waters Music Camp in Ithaca! ...and this Friday kicks off the Falling Waters Music Camp in Ithaca! Keith Murphy and Becky Tracy, Matt Glaser, Tony Trischka, Richie Stearns, Emily Schaad, Matt Munisteri, Ethan Jodziewicz, Barry Mitterfhoff, Laurie Hart, and more. Over 70 campers have registered so far. There are still a few spots left if you've been sitting on the fence. Visit the Falling Waters Music Camp webpage for more info. Hope to see you there! The amazing Quebe Sisters warming up at the Ryman Auditorium in Nashville. Triple fiddles! 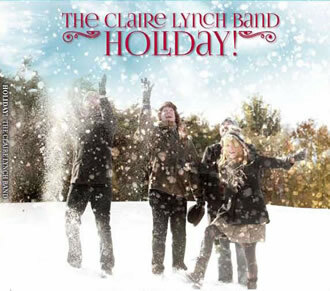 in a holiday concert at La Tourelle, Ithaca, N.Y, this Thursday, December 4th, 7:30 p.m.
What a rare treat to have Claire Lynch and her stellar band visit our region twice in one year! Not only is she the 2013 International Bluegrass Music Association's Female Vocalist of the Year, but in 2014, Digital Journal.com listed Claire as “One of the 10 Best Angelic Voices of Our Time”. She shared that honor with such luminaries as Judy Collins, Alison Krauss, Sarah McLachlan, Martina McBride, Dolly Parton and Emmylou Harris. Come cozy up for a warm, intimate concert that will put you in the real spirit of Christmas. Seating is general admission and limited to 150 seats. Visit the Winter Village website for more information on the event. Jim and I will join Curt Osgood on hammered dulcimer for holiday tunes at the Tioga County Historical Society Museum's "O Tannenbaum Holiday Showcase" on Saturday, December 6th, 110 Front Street, Owego, N.Y., 1:00 - 3:00 p.m. If you've never been to the event, it is an amazing collection of Christmas trees decorated by individuals and groups in the community for a silent auction to benefit the museum. The trees are fanciful and creative and just plain fun. 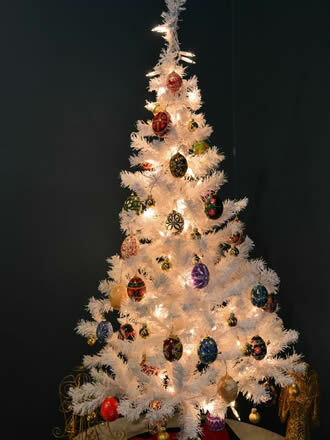 The Ukranian Egg tree is always a favorite for bidders. Come browse this "Christmas Forest", explore the museum, and raise your voice in some carols with Jim, Curt and myself. Then afterward, there are gift boutiques, homemade fudge, flavored olive oils, treasured books, educational toys, and steaming cups of coffee awaiting you in downtown Owego's many shops! Hunting for a Christmas gift for a musical spouse or family member? at La Tourelle Resort in Ithaca, N.Y. the weekend of January 9th - 11th, 2015. Not up for the whole weekend? Come just for Saturday's workshops. Plus, there are student discounts available on all of the events. For fiddle: Matt Glaser, Becky Tracy, Emily Schaad, Laurie Hart, Hope Grietzer and Rick Manning. For guitar: Matt Munisteri and Keith Murphy. For banjo: Tony Trischka, Richie Stearns, and Paul Fairbanks. For mandolin: Barry Mitterhoff & Rick Manning. For bass: Ethan Jodziewicz. Styles taught will include bluegrass, swing, old time, contra, Irish, french canadian, Scandinavian, and others. Instruction will be offered at beginner, advanced beginner, intermediate and advanced levels. Hope to see you at the camp! I hope that all of your holidays this year create moments of joy and thanksgiving! We had a marvelous time visiting family, dear friends, and grandkids in Colorado last week. The Denver area, Castle Rock, and Buena Vista were all on the "tour schedule". We were able to visit with three of Jim's daughters and welcome our newest grandbaby, Lucy Jeanne, into the world. Anyone who knows me knows that my absolute favorite fiddle tunes are slow, wistful waltzes and aires. Beyond gorgeous. Take a listen. Friday, November 28th : The Annual Fiddlin's Fun "Day-after-Thanksgiving Jam". 7:30 - 10:00 p.m. Work off that extra pumpkin pie with some fiddle tunes and fun! Unitarian Church meeting room, 183 Riverside Drive, Binghamton, New York. Enter through the back parking lot. January 9th - 11th. Falling Waters Music Camp, La Tourelle Resort, Ithaca, N.Y. There's s till time to register for camp! A full weekend of workshops, jams and concerts with top-notch instructors from all over the country. For more information, visit here. Friday - Sunday, November 7th to 9th: Fiddle Hell at the Westford Regency Inn, 219 Littleton Road, Westford, Massachusetts. $99 rooms if you wish to stay there, and great food both onsite and nearby. Sessions, workshops, the concert and dance, and late night jams. 155 scheduled workshops in genres including Bluegrass, Breton, Cajun, Cape Breton, French Canadian, Gypsy, Irish, Jazz, Klezmer, New England, Oldtime Southern, Scottish, Swedish, Swing, Western Swing. Click here for fun short clips from a previous Fiddle Hell event. For more info, visit their website. We had great fun apple picking with family in upstate New York's rolling hills. The trees are about at their peak, just lush with brilliantly colored leaves. And there's nothing that says home quite like the aroma of apple pie. Jim and I had a marvelous time at the Walnut Valley Festival in Winfield, Kansas last month. Normally it's a yearly pilgrimage for us (I started going way back in 1987! ), but we've missed the last few, so catching up with old festival friends was very special. The festival hosts all of the national championships for mandolin, flatpick guitar, bluegrass banjo, hammered dulcimer, and mountain dulcimer, and the International Fingerstyle Guitar Competition, so the skill level of musicians it attracts from all genres is phenomenal. The jamming is heavenly! OK, I'm REALLY excited about the Falling Waters Music Camp in Ithaca, NY coming up this January! I mean jumping up and down excited. And not just because of the outstanding caliber of instructors, the incredible evening concerts, the fun jamming, the fantastic venue, and the fact that it's in our area. Among the many talented instructors this year are two of my favorite musicians on the planet: Keith Murphy (guitar, mandolin, piano, vocals, foot percussion) and Becky Tracy (fantastic fiddle). They play with skill and passion and heart, and I can testify from taking classes from them at Ashokan that they're top-notch instructors as well. Here they are playing "Lukey's Boat" on Youtube. If you want to lift your playing to the next level, come to camp this year! Registration is open, with early bird discounts until October 17th. You can come two days, all three days, just Saturday, or just for the Saturday night faculty concert. 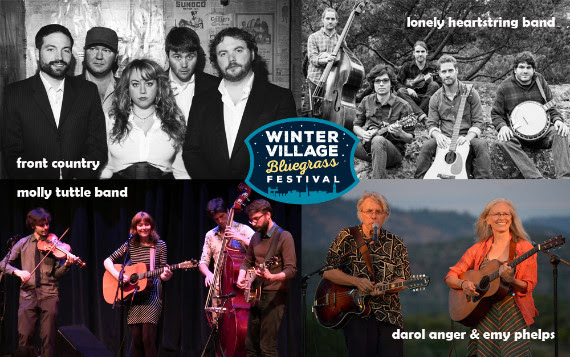 Visit http://wintervillagebluegrass.org/musiccamp/ for more information. 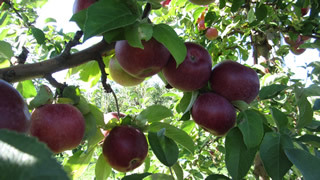 Saturday - Sunday, October 4 - 5: The Newark Valley Apple Festival, Bemont Billings Farmstead, Route 38, Newark Valley, NY. Concerts all day with local and regional musicians, a contra dancing tent with live bands, kids activities, great food, horse and wagon rides, costumed demonstrators show cider pressing, blacksmithing, spinning, soap making, candle dipping. Salt potatoes and caramel apples. Always a fun weekend! Goldenrod blooming, purple asters in the roadside ditch, crickets instead of bird song in the mornings: looks like Fall is slipping in. But Fall brings with it lots of local festivals with live music, always a fun way to spend a Saturday afternoon. Check out some of the local offerings in your area. If there are fiddle concerts or jams on their schedules, you may just come home humming a new tune! Saturday, September 6: Open jam session at the Colorscape Arts Festival in Norwich, N.Y. West Park Interactive stage, 3:00 pm. Amazing artists on display, and lots of live music going on all weekend too! More info HERE . 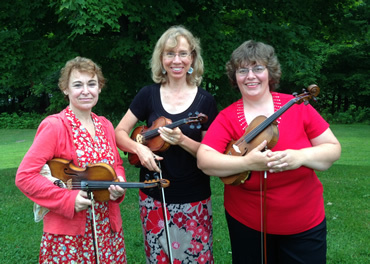 Sunday, September 7: Fiddlin's Fun, our local chapter of the New York State Old Time Fiddlers' Association, will be performing at the New York State Fiddlers' Hall of Fame in Osceola, N.Y., from 2:00 - 5:00 p.m. More info HERE. Thursday, September 11th: Cantrip in concert at the Canaan Institute. 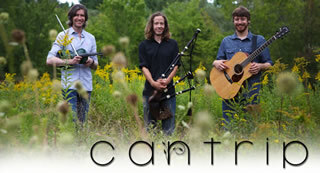 Cantrip weaves together traditional and contemporary Scottish songs and tunes on fiddle, bagpipes and guitar. Concert starts at 7:00 pm, jam session to follow. For more information, mike@cinst.org and to reserve a seat. Saturday, September 13th: Champion fiddler Tim Crouch workshop and concert, Beach Lake Fire Hall, Route 652, Beach Lake, PA. Tim is the five-time winner of the Arkansas State Fiddle Contest and two time winner of the SPBGMA contest. Free workshop 2:00 pm, concert at 7:30. $10.00 concert admission. Where has the summer flown? Between blueberry picking, evening walks, harvesting beets, stargazing, fun family visits, and of course fiddling, the warm days have passed in a whirlwind. The New York State Old Time Fiddlers' Association Picnic and induction weekend was great fun. Craig Duncan from Nashville (and author of countless Mel Bay books) was the featured artist. It was nice to catch up with old friends and to hear past Hall of Fame inductees perform; we had ice cream afterward with 1985 inductee Ernie McDonald (right), who's tune "The Happy Fiddler" is this month's Tune of the Month. And on that topic, thanks to the folks who've sent me ideas for the tune of the month. It's nice having so many good tunes to pick from! Saturday - Sunday, August 9 - 10: Annual Kids Fiddle Camp sponsored by the New York State Old Tyme Fiddlers' Association in Osceola, New York. A fun weekend of music workshops on fiddle, guitar and piano, camping, crafts, and activities. This years featured fiddler is Autumn Rose Lester. For more information, contact Jackie Hobbs at jmhobbs@twcny.rr.com, or visit HERE. Saturday - Sunday, August 16 - 17th: Old Time Fiddlers' Fair at the Genesee Country Museum. One of my favorite fiddle events of the year, this gathering brings together fiddlers from all over New York State for a weekend of concerts, open stages, and jamming in the lovely 19th century setting of the historic village. Visit HERE for more information. Thursday, August 21st: The Coracree Trio presents a house concert of Celtic, old time, European and original music at the Canaan Institute outside of Ithaca, N.Y.. Coracree is Jane Rothfield on fiddle, banjo, and vocals; Bill Quern-Tenor on banjo, mandolin, accordion, harmonica, and vocals; and Sarah Gowan playing guitar, concertina, foot percussion, and singing. 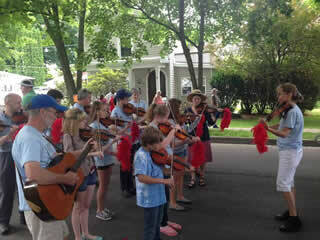 The Toast n' Jammers and friends had a fabulous time fiddling in the Owego Strawberry Festival parade! Here we are warming up in the line-up area. Having an upright bass and two guitarists with us this year really helped to hold everything together as we marched through the streets. The fiddlers will be performing again on Thursday, July 31st at the Owego Farmer's Market, relocated this year to the deck overlooking the river on Front St in Owego. Come out for a stroll, browse the fresh veggies and tap your toe to some fiddle tunes! 6:00 - 8:00 pm. It's exciting to see a community of people coming together to share their love of music. I've had lots of fun jamming so far this summer, including a sunny Sunday afternoon at the Watkins Glen Fiddlers Gathering in June, facilitating the jam tent with George Wilson, Mike Ludgate and Howard Blumenthal. 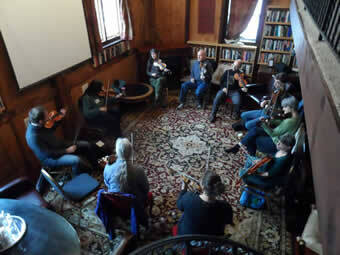 And the Fiddlin's Fun jam group in Binghamton, N.Y. is growing by leaps and bounds. Pop by the Unitarian Church on Riverside Dr in Binghamton any fourth Friday of the month, 7:30 pm, to listen or play along. We'd love to have you join in! It's been a fun month! 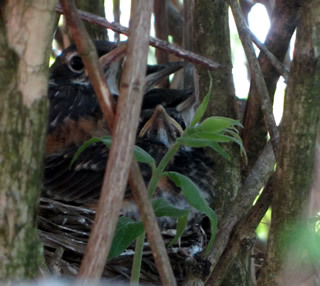 The poppies are popping and the peonies are blooming and the baby robins in the nest outside our dining room window have fledged. The Vestal elementary school's After School Fiddle Club that I've been working with had their debut concert this week, with tunes ranging from an Irish jig to a Scottish march, an American square dance tune and a bit of western swing. The kids played wonderfully, with the parents and families in the audience toe-tapping along. Monday, June 9th, I'll be playing a few fiddle tunes live on our public radio station, WSKG, to promote the Old Time Fiddlers' Gathering in Watkins Glen, N.Y. I think 11:00am-ish. More details on that event below! The Toast n' Jammers Kids Fiddle Tune Club has an exciting month ahead, with the group playing a "Fiddling on the Front Porch" concert at Your Home Public Library, 107 Main St, Johnson City, on Saturday, June 14th, 11:30 am - 12:30. Bring a lawn chair to the library and enjoy some free fiddle music! 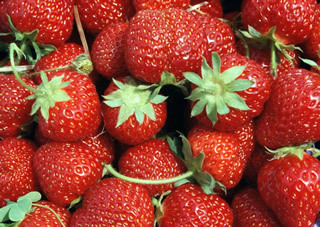 Then on Saturday, June 21st, the Toast n Jammers will be part of a group marching and fiddling in the Owego Strawberry Festival Parade, 10:00 a.m. Always one of our favorite activities. More info on that event below. Saturday - Sunday, June 14 - 15th: The 25th Annual Old Time Fiddlers' Gathering. A lovely event at Lakewood Vineyards in Watkins Glen, N.Y., on the west side of Seneca Lake. Concerts, free workshops and lots of jamming. Saturday the event runs 1:00 - 6:30, Sunday 1:00 to 5:30. I'll be teaching a waltz workshop Sunday afternoon at 4:00 p.m. and helping out at the jam tent. For more information on the event, visit www.fiddlersgathering.org. Saturday, June 21st: There's still room for more fiddlers to join the Owego Strawberry Festival parade group, rhythm instruments welcome too. We're playing some simple tunes, and you don't need to know them all to participate. Tunes in pdf and mp3 format here. The parade starts at 10:00 a.m. and the route is about one mile long. Email me if you'd like to join in and I'll add you to the parade distro for more details. Make some marvelous memories and kick back with a strawberry smoothie afterward! June 27 - 29th: Old Songs Festival, Altamont, N.Y. This festival is one of the funnest on the planet, with too much good music to describe. Three stages of concerts, workshops, jams, and a gathering of some of the best traditional musicians around. There'll be lots of great fiddling over the weekend, especially The Panache Quartet, with four fiddlers! Donna Hebert, Andrea Beaton, Jane Rothfield, and Veronique Plasse serve up some hot harmonies and rhythms. 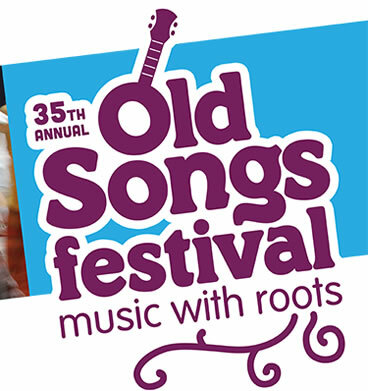 Visit http://oldsongs.org/ for more information on the festival. This is my absolute favorite month of the year, when the air is deliciously warm and the world begins to bloom. Suddenly it seems there are a million projects to tackle at once and I scarcely know where to begin. Weed the flower beds? Throw the windows wide open and clean house? Plant some carrots and beets? Or just play a fabulous fiddle tune to celebrate? Like Brian Pickell's "End of Winter" (performed here on Youtube by Canadian fiddler Shane Cook). Ever tried to walk and fiddle at the same time? It's easier than you think! 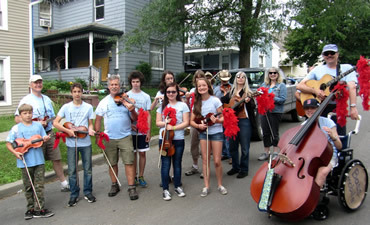 We have a group of fiddlers marching in the Owego Strawberry Festival Parade this year on Saturday, June 21st, 10:00 a.m., and we'd love to have you join us! We're playing a few simple, marchy tunes. The parade is approximately one mile long. Guitars and other acoustic instruments very welcome as well. You don't need to know all of the tunes to participate, just play on the tunes you're comfortable with. The recordings at the link above will give you an idea of the tempos needed. Like to participate? Send me an email at hopefiddle at gmail dot com and I'll add you to the parade mailing list for updates on event details. Fiddle teachers, feel free to pass the info along to your students, too! Sunday, May 18th: Jam session, potluck, and English Dance Party in Ellis Hollow. From Kathy Selby: "In an attempt to break the fundamental law of physics that says that it is impossible to have Too Much Fun, we will start festivities 2:00 pm - 5:30 pm with an open jam session, then have a potluck dinner followed by English country dancing from 6:30 'til 10 pm." WHERE: The Ellis Hollow Assembly Rooms. These are Kathy and Séamus' living room, featuring a raised stage area, a 400 sq ft hardwood dance floor and an adjoining screen porch with room for more dancing. About 8 miles East of Ithaca. Directions at www.kathyselby.com/directions.htm PLEASE WEAR CLEAN SOFT-SOLED SHOES for dancing. 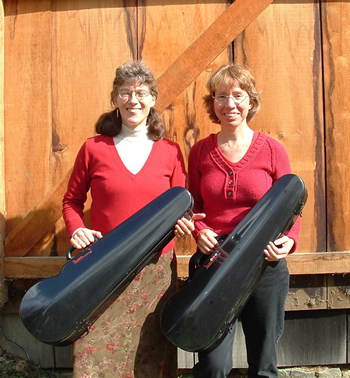 THE ELLIS HOLLOW ASSEMBLY PLAYERS will play the tunes for the dancing: Musicians will include Hope Grietzer and Kathy Selby (fiddles) and John Wobus (piano). Our callers will include the very special Pamela Goddard, Katy Heine, Ted Crane, and Bob Nicholson. at Juniata College Campus, Huntington, PA.
OK, it's a little bit of a drive, but there is a fantastic collection of fiddle instructors/performances lined up for this weekend festival, including old time fiddle master Bruce Molsky, French Canadian fiddler Pascal Gemme, and amazing fiddlers Laura Cortese and Mariel Vandersteel. Also instructors in guitar, mandolin, banjo, harmonica, and more. I was thrilled to learn that Terry Glasspool had created an English Country Dance to a tune that Jim and I composed for our friend Katie Korejwo's wedding, Katie's Waltz. The dance for Katie's Waltz had its formal debut this past weekend at the Binghamton Ball, this area's annual grand English Country Dance event. I've known Katie since she was a child, so this was a very special event. Thanks Terry! 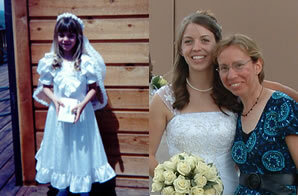 Katie at her first holy communion and on her wedding day. 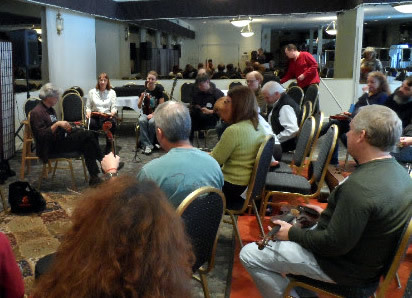 On a more somber note, our local chapter of the New York State Old Time Fiddlers' Association (Fiddlin's Fun) lost two of its members this month, hammered dulcimer/banjo/guitarist John Klehr and whistle and bodhran player Dan Ragan. John had been a musical friend of mine spanning nearly thirty years, Dan for just a few, and I will miss the delightful music they created, their smiles and gentle spirits. Rest in peace, gentlemen. Friday - Sunday, April 11 - 13th: Enchanted Mountain Music Festival, bluegrass and roots music, Holiday Valley Resort, Ellicotville, N.Y. Concerts, singing and instrument workshops, jamming, and relaxing at the beautiful Holiday Valley Resort in the Enchanted Mountains of western New York. Festival performers include Frank Solivan & Dirty Kitchen, Nora Jane Struthers & the Party Line, Creek Bend, and Paris Texas w/ Dee Specker. Wednesday, April 16th: Community Sing-a-Long. A wonderful day of sharing song with those in our community for people of all ages. No experience required! Vestal Library, 320 Vestal Parkway East, Vestal, N.Y.
11:00 am - noon: Programs for children up to age 6 (with parents). 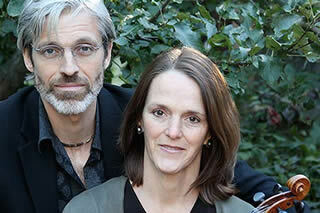 6:00 pm -8:00 pm: Teen songwriter's circle hosted by Mike & Jo Whitney. Saturday, April 26th: Cabin Fever Concert at the Vestal Library, 320 Vestal Parkway East, Vestal, N.Y. Hear Curt Osgood on hammered dulcimer joined by fiddler Henry Jankiewicz, banjo wizard RJ Siegers, with Jim MacWilliams on guitar. Selections from Old Timey, folk, Americana, Celtic, French -Canadian, early jazz and blues standards and more.This concert is FREE to the public and sponsored by Friends of the Vestal Library. 7:00 p.m. For more info: 607-754-4244. This concert will be a wonderful way to celebrate spring! 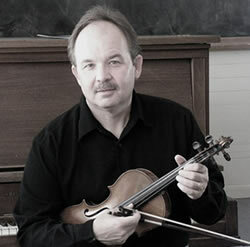 Saturday, April 26th: Fiddle workshop and concert with world renowned fiddler Bruce Molsky! Workshop: 1:30 - 3:30 p.m., concert 7:30 p.m. Bruce is an inspired musician, a fantastic teacher, and one of my absolute favorite fiddlers. Experience level for the workshop: If you're comfortable with the instrument and have at least a small repertoire of tunes then you'll be fine. The skeleton of the tune is taught first, and then built upon with additional bowing, variations, etc. You can just go as far as is comfortable. No pressure! It's suggested you bring a recording device to the workshop. Tunes are taught a phrase at a time, first melody, then bowing, and then piecing things together, so you can find and work to a level that's most comfortable for you. Written music will not be provided. The workshop and concert will be held at Valley Folk Music at 171 Cedar St, Studio A, Corning, N.Y. To reserve your place at the workshop, email info@valleyfolk.org or phone (607) 962-4461 for instructions before April 21st. Checks made out to Bruce Molsky. COST: To attend both the workshop and concert, the price is $40. For just the workshop: $25 adult; $20 student. 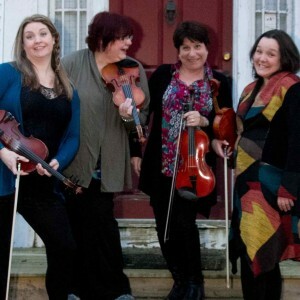 Local fiddlers - let's form a car pool and have a musical adventure in Corning! 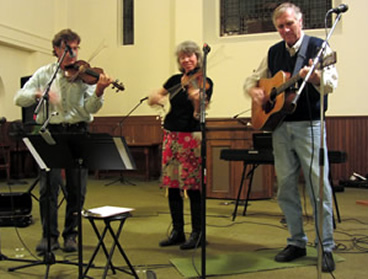 Sunday, April 27th: Contra and square dances for Tioga County Contra and Square Dance, in Owego, 4:00 - 7:00 p.m. Kathy Selby (fiddle), Gordon Bonnet (flute) and John Lewis (piano). At Tioga Trails Cafe, 50 Lake Street, Owego, NY. Lots of fun to dance to these folks, (no experience necessary, all dances taught) or just to listen! February was such a bitterly cold month! You know it's been a bit nippy when the thermometer climbs above twenty degrees and your heart leaps for joy. It makes me appreciate our musical community all the more, gathering despite the weather to play tunes and keep our spirits warm. If you're looking for others to play with, visit the "Local Jams" link on my website. You can listen at the jams until you feel ready to play, or join in just on tunes you're confident on. 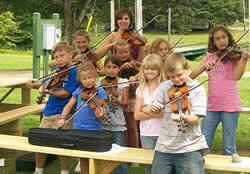 In other news, the after-school Fiddle Club at one of the Vestal elementary schools is up and running! It's a fun group, learning fiddle tunes entirely by ear, with violins, violas, and a cello all playing together. The program will continue through the spring semester. How does the violin, one of the smallest of instruments, produce such a powerful and complex sound? 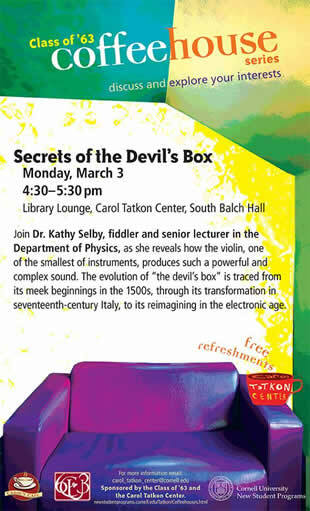 Kathy explores the science behind the sound of the fiddle, tracing its evolution from its meek beginnings in the 1500s through its transformation in 17th century Italy to its re-imagining in the electronic age. All are welcome, admission is FREE, with free refreshments provided. Dave Ruch and Jeff Davis (The New Boys of Old New York) will be teaching a workshop at the Canaan Institute in Brooktondale, N.Y., just east of Ithaca, 1:00-3:00 pm, on Long Island dance tunes from the 19th century. "Old Long Island was a hotbed of tunes, and there are at least two collections to prove it: William Sidney Mount (1807-1868), the famous painter of The Banjo Player and The Bones Player, was also a fiddler; his collection spans music from English marches, Irish jigs, to tunes learned from the minstrel stage and from black fiddlers. The collection of Bellport’s Captain Isaac Homan (1816-1901)–recently uncovered by Dave Ruch–also contains a huge variety of tunes—reels, hornpipes, cotillions, waltzes, and much more. Both reflect the intense swirl of influences upon fiddlers living near the growing vortex of New York City in the mid-Nineteenth century." Dave and Jeff will talk about the two collections and teach several tunes. Bring any instrument (they’ll be playing fiddle and mandolin). Bring a recording device if you have one. Contribution: $20. All instruments welcome. Pre-registration required. RSVP today via email mike@cinst.org to reserve a seat. 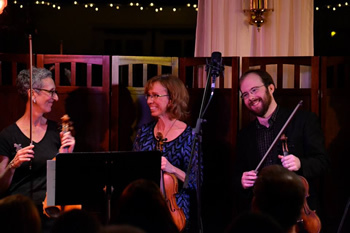 Saturday March 8th: The Binghamton Contra Dance Callers' Gathering at Trinity Church, 44 Main St., Binghamton, features TWO of my fiddling friends, Autumn Rose Lester and Eileen Nicholson, accompanied by wonderful pianist Eric Anderson. 10:00 am - 4:00 pm. 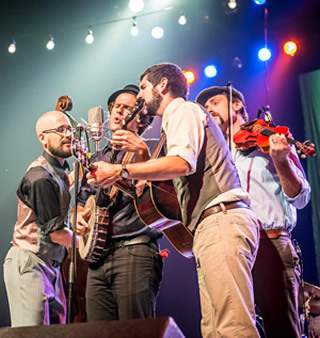 Wednesday, March 12: The annual concert to benefit the completion of your Cayuga Waterfront Trail will take place at The Haunt in Ithaca, N.Y., and will feature the nationally renowned indie-folk band The Steel Wheels. This band has performed at music festivals across the country and has seen recent acclaim, including nominations for five Independent Music Awards in 2010. Appropriately enough, The Steel Wheels are also famous for their unconventional means of touring... by bicycle! Ever been to a house concert? If so, you know what a memorable musical experience one can be. So just imagine what a house dance would be like! WHEN: Sun Feb 9, 6:00 - 9:30 pm. WHERE: The Ellis Hollow Ceilidh Hall. This is Kathy and Séamus' living room, featuring a 400 sq ft hardwood dance floor and a vaulted ceiling. About 8 miles East of Ithaca. Directions at www.kathyselby.com/directions.htm PLEASE WEAR CLEAN SOFT-SOLED SHOES. WHO: Everyone who loves to dance is very welcome. Please tell your friends! WHAT is a "ceilidh dance"? "Ceilidh" (KAY-LEE) just means "gathering", so we can have any kind of dances we enjoy! We will likely dance some contras, barn dances, squares, and some dances from England, Scotland and Ireland. All the dances will be easy to learn and very fun to do. DESSERTS: There will be delectable desserts. SUGGESTED DONATION: $6, or bring something delicious to eat. 2014 Winter Group Fiddle Class Starting! Wednesday, February 19th through Wednesday, March 26th. 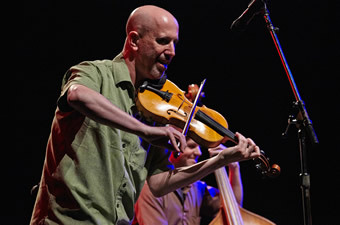 This class will expand your repertoire with some common old-time, Irish, bluegrass and New England style fiddle tunes while reinforcing your right and left hand techniques. Tunes will be primarily taught by ear, although sheet music will be provided. Targeted at the beginning fiddler. Friday, February 7th: Fiddlin's Fun fiddle tune jam at the Roberson Museum as part of the Binghamton First Friday Art Walk. 30 Front St., Binghamton. 6:00 - 8:00 p.m. Come to play or just to listen! 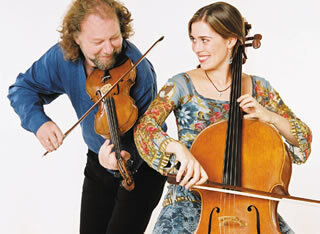 March 14th - 16th, the Ashokan Fiddle Camp in Ashokan, N.Y. is hosting a special weekend of fiddle and cello workshops and a concert with world-class Scottish traditional musicians and instructors Alasdair Fraser and Natalie Haas. I've attended one of Alasdair's workshops before, and they are fantastic learning experiences and an awful lot of fun. Has everyone made their New Year's Resolutions? One of mine is to write more fiddle tunes this year, aiming for one a week. Even if a lot of them end up being tossed, I think getting your brain in that creative mode ups the odds that a few inspired gems may fall in your lap. At least I'd like to think so! Just one more week until the Winter Village Music Camp in Ithaca! The detailed descriptions of the music workshops to be offered are available HERE, along with the instructor profiles. There are so many fascinating topics - wish I could listen in on all of them! 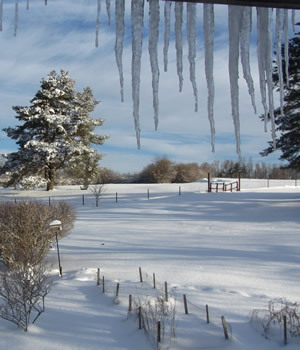 at La Tourelle Resort, Ithaca, N.Y.
Friday to Sunday, January 10 – 12, 2014. Instructors include: Darol Anger, Tony Trischka, Judy Hyman, Richie Stearns, Andrew Van Nordstrand, Grant Cordy, Joe Walsh, Laurie Hart, Ethan Jodziewicz, Hope Grietzer, Jeff Claus, Paul Fairbanks, and Rick Manning. 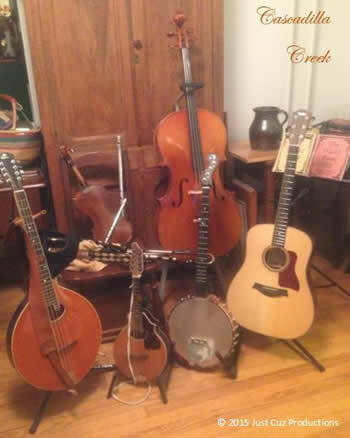 Instruction will be offered on fiddle, guitar, mandoling, banjo, banjo uke, and bass at beginner, advanced beginner, intermediate, and advanced levels. The challenge and the joy of learning a new fiddle tune is taking the time to move past the first step, learning the notes, to reach that place where you hear what the tune is trying to say. As I repeat a new tune, I find my mind moving from notes to phrases, and then from phrases to the feelings they evoke. A well written tune will get you to that place more quickly. A tune you find yourself attracted to right away will do the same. In the end, the notes are just a tool to get to those feelings. Learning a tune is like any other relationship, where you learn more and more about the other person the more often you meet. There has to be that initial attraction to a tune though, for me to want to invest the time. So while some tunes end up being just acquaintances, others will become life long friends. Andrew VanNorstrand's latest blog entry has some fantastic thoughts on playing notes vs playing music, and moving a fiddle tune beyond the notes on a page. I think you'll enjoy what he has to say.